We believe in making outdoor furniture that inspires as well as relaxes. 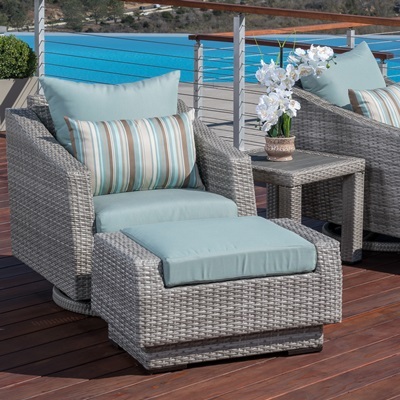 Whether you want to unwind after a long day or just soak up the sun, do it in style with the Cannes six-piece outdoor seating set that's comfortable, durable, and virtually maintenance free. 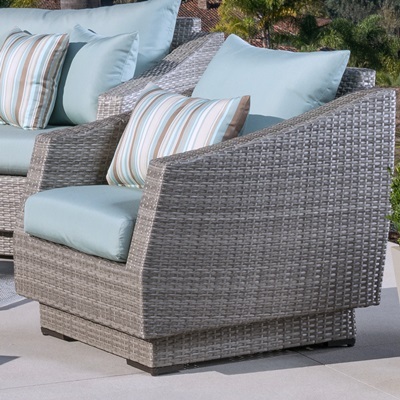 Beautiful contrasting Gray weave is the cornerstone of the Cannes Collection, giving your outdoor living space style and class and a source of pride for years to come. Set includes a loveseat, two club chairs, four coordinated accent pillows, ottoman, and a woven coffee and side table. Seats come fully assembled, with minor side table assembly required.